Assam Chief Minister Sarbananda Sonowal directed the forest department to carry out the highland construction work under Kaziranga National Park on a war footing to complete the same before monsoon. Sonowal who visited the highland construction sites at Mihimukh under Kohora Range of the National Park on Monday emphasised on ensuring safe shelter for animals during the flood and issued several directions to the forest department in this regard. Chief Minister Sonowal during his visit asked the forest officials to plant adequate saplings on the highlands once the construction work is over. Sonowal particularly stressed on planting trees which could be used as fodder by the herbivorous during flood. He also asked the forest department to take appropriate measures to ensure medical facilities for the animals at the highlands during flood. Considering high number of tourist footfall in the Park during winter, the Chief Minister also directed the forest department to develop the highlands in a tourist friendly manner so that the visitors could enjoy better view of the Park and its exquisite beauty from the highlands. 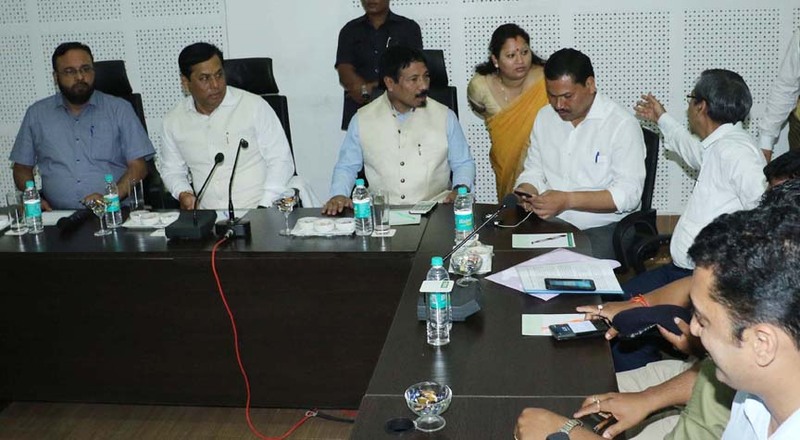 Agriculture Minister Atul Bora, MLAs Mrinal Saikia, Bimal Bora and Rituparna Baruah, Director of Kaziranga National Park, senior officials of forest department, Golaghat DC and SDO Bokakhat also accompanied the Chief Minister during the visit. After the visit, the Chief Minister also held a meeting at Kohora to take stock of security measures of the Park with senior government officials. Deputy Commissioners and SPs of Nagaon, Golaghat, Karbi Anglong, Sonitpur and Biswanath also took part in the meeting.